"Don't be such a brute, Preben. We're not married." The first of three new releases from Kino focusing on Swedish silent film director Mauritz Stiller, Sir Arne's Treasure (1919), gave an indication of Stiller's aptitude for the historical epic. This picture, made the next year, puts the focus on Stiller's light comedy touch in a tale of the sexes, firmly in the Jazz Age mindset. Irene Charpentier (Tora Teje) is the bored wife of professor of entomology Leo Charpentier (Anders De Wahl), who is rather focused on beetles rather than his wife. He does, however, have a somewhat unhealthy interest in his young niece, Marte (Karin Molander). Irene whiles away her time with extravagant shopping and taking plane rides with dynamic young Baron Felix (Vilhelm Bryde). Sculptor Preben Wells (Lars Hanson), the professor's best friend, has secretly been harboring affections for Irene himself, and overwrought with jealousy over Baron Felix, Preben makes accusations about Irene's fidelity. Outraged at Preben's meddling and Leo's blindness, Irene leaves them both and heads back to mother, but things get even more tangled as Preben gets the professor to reluctantly challenge the baron to a duel. It's very much a comic tale of the early 1920s in its mood, and in its disregard for marital niceties and its frivolous character it has much in common with the marital comedies of Cecil B. DeMille, such as Old Wives for New and Don't Change Your Husband. However, where DeMille often is constrained to give a conventionally moral conclusion to his tales, Stiller is having none of that. Divorce is not only easily acquired in Erotikon, but it's considered a positive good and there's really no tut-tutting about it. When you add to the mix some shocking-for-its-day sequences of both Irene and young Marte smoking, and Marte dangling her leg sexily, the Edwardian age is given an abrupt heave-ho. Much as Hamlet focuses on the play-within-a-play device that sets the final action in motion, Erotikon uses the device of the fictitious ballet Schaname to demonstrate the unspoken emotions of its characters. In that ballet, the Shah believes that he has been cuckolded by his best friend Tariel, at the hints of his wife Schaname, who actually loves Tariel and has been rebuffed by him, Tariel choosing to remain faithful to his friend. The mirror image of the situation occurs in the main storyline, as Preben is all too willing to corrupt Irene and the professor remains utterly clueless about it, standing by his friend and preferring to believe the worst about his wife instead. Preben doesn't seem to realize the applicability of the ballet as he sits and watches, perhaps because he is so focused on his object of desire. But when she rebuffs him, he can take no more, storms out, and the plot is set into motion. Teje was a Swedish stage actress who only made a handful of films; she's quite good in this, other than a few stagey moments where she seems to be playing to the back rows. She definitely has the role of the Modern Woman down pat, though, and there's little doubt that she's both intelligent and determined. The rest of the cast tends to be quite naturalistic in their portrayals. Hanson has a vivid intensity that makes him quite credibly blind to what he's about; he would go on to star in The Wind (1928) with Lillian Gish, one of the last great silents (and unaccountably still AWOL on DVD). De Wahl is quite humorous as the professor, but many of his scenes are stolen by Torsten Hammarén as another entomologist, Sidonius, who is even more fascinated by insects, often quite hilariously. With an enormous and ridiculous shock of white hair and an odd bowlegged walk, Sidonius inspires laughter just being on the screen. The comedy is otherwise fairly urbane, but it's solid and holds up well today. What works against the comedy is a criminally inappropriate score by Bruce Bennett and Paul Mercer. A setting for violin and piano, recorded in what sounds like a cavernous warehouse, it almost utterly disregards the onscreen action and drifts into tendentious and dull seriousness at the most inopportune times. Apparently they were under the impression that, being Swedish, this was a difficult film and should bear the burden of difficult music. But the frothy comedy can't bear it, not one bit, and the result is highly destructive to the mood of the film. Better to have had an arbitrary needle-drop score of ragtime tunes, or no score at all, than this ragged abortion. Image Transfer Review: The original full-frame picture generally looks quite good. Restored from several different original prints, during much of the running time it looks excellent. One short segment near the end suffers from wear and decomposition, but otherwise only the expected minor scratches and speckling are present. There's quite good detail most of the time, and contrast levels are acceptable overall. The film is presented in sepia, with blue tint for night sequences, though intertitles are in plain black and white. Audio Transfer Review: The 2.0 DD score doesn't suit the picture at all, but it seems to have been adequately transferred to DVD, aside from the cavernous sound. Range is good and fidelity acceptable under the circumstances, but that doesn't make it any less inappropriate. Extras Review: Frequent Criterion commentator Peter Cowie leads the viewer through two featurettes (which can be played together or separately). The first is a repeat of the discussion of Stiller's art and career, Rediscovering Sweden (12m:03s), and the second and shorter and is devoted specifically to Erotikon (6m:33s). Both are packed with valuable and interesting information, with clips used sparingly to illustrate a point. 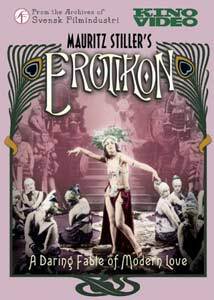 Cowie notes that this was one of the most expensive films ever made in Sweden; if the implications are to be believed, composer Kurt Atterberg was actually engaged to write the ballet Schaname in order to provide a verisimilitude that even von Stroheim would find impressive. Kino also adds a short onscreen bio and selected filmography for Stiller. The decorative intertitles are presented in English, but onscreen Swedish text is helpfully translated in removable English subtitles. A fun and highly modern comedy of the sexes, in a fine restoration but saddled with a woefully wrong musical score.